As a child I was often told the story by my maternal grandfather that his mother had told stories of having been descended from an Irish princess. This was the same dear man who held us all captive with stories of how his family had also captured and entertained the leprechauns. He constantly had us looking for them and I chased the end of many a rainbow. He had an uncanny gift for finding four leaved clovers and ‘magical’ toadstools. So it was easy to go along with his fabulous stories that no doubt his mother had enjoyed with him, she herself being a native of Drogheda in Ireland. I often did wonder about that princess story though. Finally I can now put that one to rest with some context. My great grandmother (Mohan’s) family came from the county of Louth. Her father was a Mohan and her mother a Duffy. One of the most common familial names in the county of Louth, which also happens to be the smallest county in Ireland is Duffy. In fact Duffy is recorded as far back as the 6th century when the name was Dubtach. The name continues to be well represented even to this day. Mid way through the 6th century the Dubtach family or clan were a pagan sept of Gaels. The most famous of the Dubtach family that we have recorded was a young girl known as Bridey. 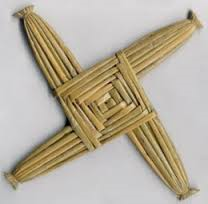 She was also recorded as being called Biddy or more famously, St Brigid or St Bride. Indeed St Brigid is more famous in Drogheda than St Patrick. (go women’s lib I say). The Chieftain of the family also happened to be Bridey’s father. Her mother was a Christian slave named Brocessa. Bridey was brought up with these Christian beliefs and apparently endeavoured to explain the passion and death of Jesus to her dying pagan father, she wove a cross from rushes on the floor to demonstrate the passion. This cross became known as the now famous St Brigid’s cross. Her feast day is celebrated on the 1st February each year. The St Bridget Cross is believed to protect homes from want and evil. Bridey is buried next to the more famous patron saint of Ireland, St Patrick in Downpatrick. Now what does this have to do with us? Well Mary Alice Mohan’s mother was a Duffy! Who could say whether she descended from that particular line, but it obviously was a famous story that made it’s way down the generations. So that dear reader I am pretty sure is your ‘princess’ relation.